With the Grace and Blessings of the Lord, Gurudev Sri Swami Sivanandji Maharaj and Gurumaharaj Sri Swami Chidanandaji Maharaj Spiritual & Yoga activities are flourishing at Sivannda Ashram, A’bad. More & more people, inspired by Spiritual head of the ashram, Pujya Sri Swami Adhyatmanandaji Maharaj are involving themselves in the Ashram’s selfless services to humanity and evolving in their quest for achieving higher goal of life. Daily worship services at Lord Vishvanath Temple and at Sri Sri Maa Ashtalakshmi Bhavan create Divine Vibrations at the Ashram. Prayers & Meditation at Sri Chidananda Dhyan Mandir bring peace & joy to countless Sadhakas. Daily Evening Satsang (9.00pm –9.45pm), Sunday satsang (8.30 am -10.00 am) and ‘Paduka Pujan' on Thursday, Satyanarayan Puja on Purnima day, Gayatri Yajana on first Sunday, Lalita Shashra Nama & Yoga activities: all these have made Sivananda Ashram a pilgrimage place (Yatra Dham) in the midst of busy & noisy city life. Large numbers of new comers joined the Morning Yoga Session (5.30am - 7.00 am) scheduled for the beginner at the start of New Year 2008 from Jan 1, 2008 – Jan 10, 2008 and Jan 15, 2008 to Jan 25, 2008.Yoga classes for Established and Advanced students were scheduled in different batches at 5.30 am, 7.00 am and 10.00 am in the morning. Evening Yoga classes for Women group and a special group were scheduled from 4:00pm, 6:00pm and 7:00 pm. A team of dedicated yoga teachers namely Sri Snehal Bhatia, Mr. Dhawal Patel, Ms. Devashree Oza, Ms. Dhara Upadhyay, Ms. Sonal Trivedi, Ms. Sangeeta Thawani, Ms. Brinda Pandya, Smt.Surekha Sonar and Mrs. Janki Shah conducted and coordinated all the classes. During the month of January 2008, Dr. Arpna Viplladkar provided medical care daily from 10.00am to 12.00pm & 4.00 pm to 6.00 pm through Sivananda Dispensary at the ashram. Dr. Snehal Amin provided yogic therapy on Wednesday & Friday from 7.30pm to 9.30pm. As always, on third of the month wheat and grain were distributed to poor and needy families through “Vishwanath Seva Kendra”. Independence day celebration (Jan 26, 2008) Independence Day was celebrated by hoisting the Indian National Flag. Sri Suren Mehta of Winnipeg Canada was visiting the Ashram, who was honored to hoist the Flag, National Anthem was sung by all and Sri Swami Adhyatmanandaji addressed the gathering. In His Message of Independence day, Pujya Swamiji talked about the National Flag and what it represents? The saffron stands for Renunciation (Tyaga). It is the renunciation of Ego, Lust, Greed, Anger, Jealousy and other vices in us. The White stands for Peace & Truth. Green stands prosperity and the wheel stands for justice/righteousness. To achieve Peace, Joy and prosperity eradicate the vices and develop virtues. He said that what is happening these days amongst social & cultural organizations is sad. We need to develop love, harmony and mutual reverence for each other. Lead the life of purity & truthfulness. Come out from the bond of me and mine. Embarrass everybody in love and respect. If social , cultural & spiritual organizations are strong then the Nation will be strong. The flag symbolizes freedom. Freedom from the vices is a celebration of Independence day in true sense. In the evening, Rev Sri Swamiji Maharaj & devotees of the ashram were invited to Governor's House for Independence Day social gathering. 3 rd Brahmotsav of Hanuman Temple (Jan 26, 2008) "Maruti Yajana" was performed to mark the third Brahmotsav of Holy Sri Hanuman Temple and Mahaprasad was served to all the devotees. Also Sri Sunderkand Parayan by Sri Ajay Yajnikji of Delhi was organized on this occasion. Every body enjoyed his melodious singing in praise of Lord Sri Rama. On Jan 31, 2008 again Sri Sunderkand Parayan by Sri Ashwin Pathakji was organized at the ashram in the evening and a great number of devotees joined the holy satsang. Gujarat Divya Jivan Sang, under the banner of "Adhyatmananda Vikas Youth Activities" organized Sighra (spotanious) Elocution competition for college children. Twenty six kids from thirteen colleges participated. It turned out to be very challenging and interesting to all, as it brought out real genius in youth spontaneous speaking on varied subjects like, karma, bhakti, jnana, spirituality & politics etc.. Sivananda Literature was distributed to all the participants and three winners ( first, second & Third) received prizes in cash in addition.Credit goes to Dr. Prof. Chirag Pandya for organizing this program. On Jan 5, 2008 Gujarat Nursing School, Civil Hospital held graduation ceremony for the graduating students. They perform a beautiful Candle Presentation. Sri Swami Adhyatmanandaji Maharaj was invited as a special guest. 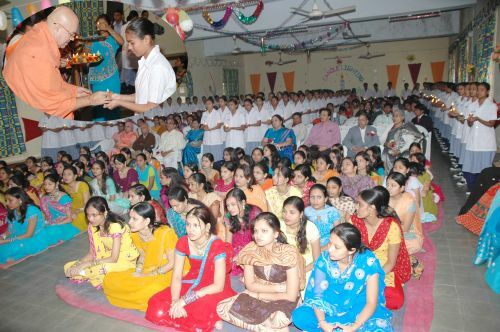 Swamiji praise the noble profession of nursing and stressed to keep the ideal of “Manav seva is Madhav seva”. 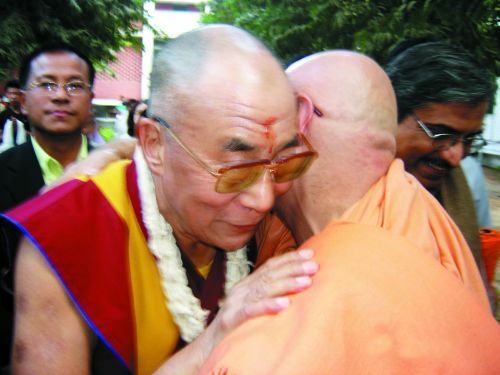 At Gujarat Vidyapeeth, World Peace Conference was organized and H. H. Dalai Lama presided over a grand congregation. It was a joy indeed to see Sri Swami Adhyatmanandaji Maharaj and H. H. Dalai Lama meeting in mutual love and reverence for each other. His Holiness Dalai Lama praise Pujya Swami Adhyatmanandaji's work and service to the Mankind in public meeting. His Holiness cherished his past memories with Pujya Swamiji and said, "one day, I was very hungry, I went to his ashram he gave me very good food, I cannot forget it." All Religion Prayer Meeting (Jan 30, 2008) On Jan 30, 2008, Pujya Bapuji, Mahatma Gandhiji's Punya Tithi, "All Religion Prayer Meeting" was held at Gandhi Ashram, A'bad. Sri Swami Adhyatmanandaji led the prayers with other religious head. Sri Swamiji Maharaj attended and inaugurated number of Bhagavad Katha's this month. On Jan 1, 2008 Revered Sri Swami Adhyatmanandaji, Sri Arunbhai Oza, Sri Marut Dave, Dr. Snehal Amin, Sri Bharat Thakkar and Yogi James from Taiwan joined a special satsang held on Golden Jubilee celebration of Anoopam Mission honoring invitation of Pujya Sri Jashbhai Saheb Ji. Gujarat Divya Jivan Sangh organized Pujya SwamiAdhyatmanandaji's Yogasana, Pranayama and Meditation Camp at Ankleshwar. In the evening, Gita Jana Yajana by Sri Swami on Chapter 9th of Bhagvad Gita was attended by large number of devotees at Sanatan Mandir. Sri Swamiji was invited for inaugural function of "Gandhi Katha" by Sri Narayanbhai Desai at Sri Jyendrapuri College of Arts, Science and Commerce. Sri Swamiji visited Vivekananda School, other Educational Institutes, Industrial places and corporate houses during his stay here. Sivananda Hospital at Bharuch is operated by Divya Jivan Sangh-Bharuch, is doing wonderful seva to poor, sick and under privileged people. They are expanding their services. On Jan 6, 2008 Sri Swami Adhyatmanandaji inaugurated hospital expansion of ICU unit equipments, Sivananda Library, Sivananda Conference Hall & Yoga Museum. Satsang at Khedbrahma (Jan 14, 2008 & Jan 15, 2008) Divya Jivan Sang, Kadiyara branch organized grand Spiritual Congregation at Ramnagar Kampa. 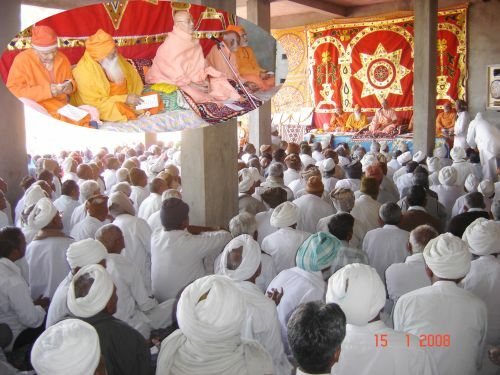 It was attended by many saints, including Sri Swami Adhyatmanandaji Maharaj. Devotees came from near by villages for the satsang with Mahatmas. "Gaupujan" (cow worship) performed and hundreds of cows were set free for grazing in the field with crops, especially made ready for them at Rojanta on Makarsankranti day. A grand feast (Bhandara) was served to hundreds of devotees. H. H. Sri Swami Gurukrupanandaji Maharaj organized these program. In the afternoon of Jan15, 2008 devotee group from Sivananda Ashram with Sri Swami Adhyatmanandaji went to Abu-Ambaji, Hatkeshwar temple, had darshan and satsang at Vadnagar. 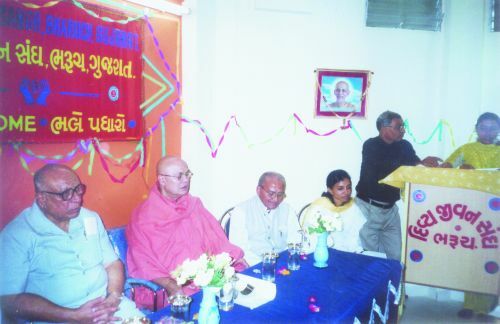 On Jan 20, 2008 Pujya Swami Adhyatmanandaji with a group of fifteen devotees from Sivananda Ashram, A'bad went to Jamnagar.They attended Sunday weekly prayer meeting at Dr. H. G. Tanna's Sanjivani Hospital. Sri Swami Maharaj conducted the Satsang and kirtan. After that, they proceeded to pilgrimage to Dwarka. The group visited Sharda Math / Sri Shankaracharya Math and had satsang and darshan. Devotees felt fortunate to have such pilgrimage in holy company of Pujya Swamiji. Then all went to Mahatma Gandhiji, Pujya Bapuji's birth place - Porbander on Jan 21, 2008. Swami conducted Ram Nam sankirtan and prayer for peace with the group at Kirti Mandir. From Porbander group went to Veraval and had darshan at Sri Somnath Temple. Shasan Gir : Sivananda devotees group then continued to Sashan Gir forest and all had overnight camp out in Neshda village. They got lucky to see about thirteen Lions in the Gir Forest. They all had gala time. At night, they had satsang with local village people. Thane (Mumbai) Jan 23, 2008 & Jan 24, 3008; Pujya Swamiji's itinerary was full of programs at Thane. On Jan 23, 2008 Sri Swamiji met a group senior citizens at Serve Sewa Samita -Kopari Thane.Pujya Swamiji brought joy and solace to them with His Holy presence and words of wisdom. Credit goes to Smt. Veena Bhatia, ex Municiple corporate of thane to organize this program. On Jan 24, 2008 Rev. Swamiji was invited to inaugurate 14th Annual Conference of Life Insurance Agents Association, Thane Division. Mr. Mathew Joseph, Managing Director and other dignitaries of LIC attended the conference with great enthusiasm. Also Dadi Godavariji of Sri Brahma Kumari's Centre, Mulund held Swamiji's satsang during his stay here. 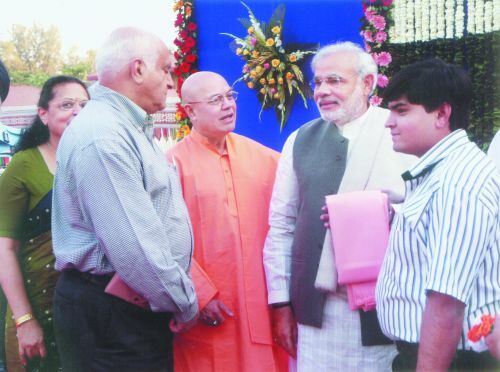 Visit to Baroda; On Jan 13, 2008 Sri Upendra Purohit, General Secretary of Gujarat Divya Jivan Sangh and members of his family organized grand Navchandi Yajna at Baroda. Sri Swami Adhyatmanandaji Maharaj and H. H. Sri Swami Narayan Swaroopanandaji Maharaj graced the occasion. 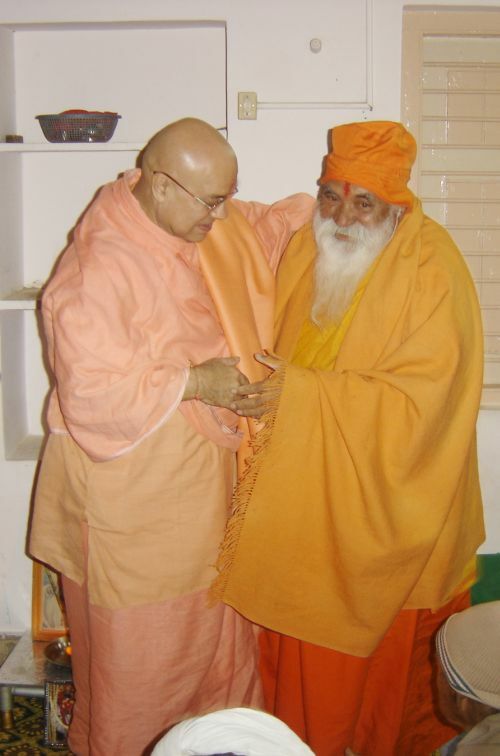 On Jan 29, 2008 Sri Swamiji Maharaj visited Baroda to attend funeral services of Dr. Gopal V. Merchant. Swamiji attended condolence meeting too on Jan 31, 2008. When you are alone, you are silent. Upcoming "Mauna Shibir" at Nareshwar ( Feb 11, 2008 - Feb 15, 2008): Come out from your busy life and enjoy being in Silence to reflect and recharge, to find inner peace and beauty of the Soul. Allow cleansing power of nature to awaken your inner SELF! To be in holy presence of H. H. Sri Swami Adhyatmanandaji Maharaj will be added Bonus.